Q1. How do I download Badland Buggy Plans once I have made a purchase? 1. 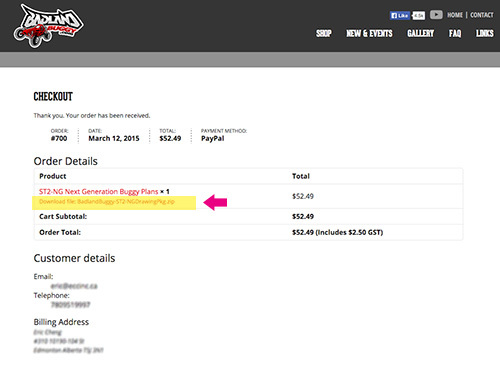 Once your payment has been confirmed you will be prompted to return to the Badland Buggy web site. click the link to return to the web site and there will be a link to allow you to download your plans. Be certain you have disabled any pop up ad blockers on your computer prior to confirming your purchase. Q1. What type of engines can I use? A1. Our vehicles are designed around using a gasoline powered snowmobile or motorcycle engine. The reasons are: lightweight, easy to source locally, simple mechanics, simple fuel systems, dimensionally small. We recommend a fuel injected, liquid cooled, chain driven engine in the 400-1000cc range. Snowmobile engines are good choice for the driver who doesn’t want to change gears (CVT – automatic belt drive system). Many snowmobile engines can be sourced with either a mechanical or electronic reverse. Motorcycle engines offer better performance & higher horsepower for the same weight of engine, however, they do require more dexterity to shift gears. Motorcycle engines perform better in hot climates. Sourcing & purchasing a reliable reverse gear box for a motorcycle engine can be costly. Q2. Can I use an automobile or VW type engine? A2. We have had a few customers modify their vehicles to accept automobile engines & transmissions, however, this is not covered in our plans. Our vehicles are designed around a “lightweight” concept, thus, installing a heavy engine block sort defeats the design intent of our vehicles. That being said, please feel free to modify our plans as you see fit. It is, afterall, your vehicle to modify how you choose. Q3. Can these vehicles be made to be street legal? A3. The street legal requirements vary from Province to Province (in Canada), state to state (in the USA) & widely vary in countries around the world. The best advice we can offer is to check your Motor Vehicle Registry (or similar) for the specific street legal requirements in your local area. In general, most on-highway vehicles require working headlights, red rear taillights, amber turn signals, seatbelts, highway tires. Our vehicles are designed to be off-road (off-highway) recreational vehicles. Q4. How much does it cost to build one of your vehicles? A4. Depending on the model you choose, expect the cost of the steel to be one of the lowest costs of your whole project. A typical ST3 or ST2-LT requires approx $300-$400 CAD of raw steel. Cost of will vary widely based on the model of vehicle you are building & the sources you choose to purchase your parts from. When building a typical ST3 or ST2-LT expect to budget $2000-$4000 CAD on the purchase of all new parts. This does not include the cost of your engine. Q5. Do you sell parts or kits? A5. No. We only offer step-by-step construction plans. Check our “PARTS LINKS” for our recommended parts sources & vendors. Q6. How do I purchase plans? Q7. I have questions. Who do I ask? A7. You can contact us anytime at info@badlandbuggy.com We attempt to answer all questions within 24 hours, however, please be patient during weekends & holidays. We have years of buggy building experience, thus, feel free to ask us anything! Q8. What’s included in the plans? Q8. All buggy plans have both metric & imperial dimensions (millimeters & inches). Trailer plans are only in inches. Steel sizes listed in the plans reflect member sizes available in North America. All plans show you how to construct you buggy from scratch at home using the minimal amount of tools. Plans are divided into sections: chassis, front suspension, rear suspension, steering, braking, etc… For some plans we also include a CAD file for all of the flat plates. This CAD file can be used for obtaining quotes from local CNC laser cutting shops. Q9. What’s the difference between ST2-NG & ST2-LT? A9. These vehicles are very similar in design with the exception of the suspensions. ST2-LT uses 2.0 series Fox Air Shocks (www.foxracing.com). These air shocks do not have coil spring, rather, their spring rate is adjusted by varying the amount of nitrogen pressure within the shock body. This translates to a lighter weight shock which is infinitely tunable to accommodate any weight of engine, driver & chassis. Fox air shocks also have tunable dampening. ST2-LT is more expensive to construct due to the higher cost of the Fox air shocks & rod ends used in the front suspension, however, ST2-LT has a longer suspension droop & suspension compression than ST2-NG. ST2-NG is designed to keep costs lower while still offering a performance based chassis & suspension design. Q10. Where can I purchase your polyurethane suspension bushings? A10. We no longer offer our own line of polyurethane suspension bushings. You can fabricate your own bushings using the dimensions shown in the plans using Acetyl engineered plastic (or Teflon or similar). Alternatively, you can source “oilite” oil impregnated bronze bushings for your suspension pivots. Oilite bushings are available at many local bearing suppliers. Check our “PARTS LINKS” for our recommended bearing suppliers.